I really enjoyed Suriya’s latest movie, although I haven’t seen the original Special 26, and wasn’t sure what to expect. What I got was a rollicking heist movie, with Suriya playing a kind of modern-day Robin Hood, albeit in 1987, as he and his merry gang thieves disguise themselves as CBI officers to rob various high-profile victims of their ill-gained wealth. With Suriya on top form, the support cast generally excellent and plenty of humour in the engaging screenplay, Thaanaa Serndha Koottam is well worth catching in the cinema if you can. The story goes like this. Suriya is Iniyan, an aspiring CBI officer who is rejected for his dream job mainly because corrupt officer Uthaman (Suresh Chandra Menon) holds a grudge against his father (Thambi Ramaiah). At the same time, many of Iniyan’s friends are struggling to find work due to corruption within the system and the high bribes needed to secure a position. Iniyan’s solution is to gather together a team of like-minded people who are willing to take part in his audacious scheme to rob the rich. And because the money they steal hasn’t been declared to the government, the victims are unwilling to report the crime, ensuring that Iniyan and his team escape scot-free every time. Iniyan then gives all his ill-gotten loot away, ensuring that his character keeps an altruistic image despite his criminal activities. As the heat builds in Tamil Nadu, the gang move their operations to Hyderabad where they can’t speak the language. I could totally relate to their default use of words they had learnt from Telugu movies, although I’ve never found it to work quite so well for me, and the resultant confusion is perfectly developed into a very funny scene. Brahmi makes an understated appearance as a Telugu CBI officer while the Charminar is visible in almost every shot to make sure we know the action is now happening in Hyderabad! There is a romance too as Iniyan falls for a girl who is drawn into his schemes. He doesn’t ever seem to find out her name, and I wasn’t clear on her connection to the original robbery, although to be honest I suspect there may not actually be one. Keerthy Suresh is fine as Iniyan’s love interest but really has little to do apart from appear in the songs and create the odd diversion in the storyline. The rest of the gang get better characterisations and even some back story to flesh out their various personas. Ramya Krishnan in particular is fantastic here and makes a scarily believable CBI officer. As “Jhansi Rani’, she uses her piercingly chilling glare (perfected in Baahubali) to excellent effect as she storms into various establishments demanding they hand over their illegal savings. Then in a blink of an eye she becomes regular housewife Azhagu Meena, planning her eldest daughter’s wedding and dealing with her disabled husband. I love her in this role, and it’s fantastic to see her in such a strong and effective role that combines comedy and drama so well. The others in the team, KP (Senthil), Ondi (Sivashankar) and Muthu (Sathyan) have smaller roles, but still add plenty of interest to the proceedings, and ensure that the team appears as a real gang rather than just an odd collection of people Iniyan has gathered together. Against them are the real CBI officers and Kurunjivendhan (Karthik), an honest if somewhat overly enthusiastic police officer who helps Uthaman in his search. Nandha is also good in a small but important role as a rookie police officer who is conned by the gang while Yogi Babu, RJ Balaji and Anandaraj all have successful cameos. Anirudh Ravichander just keeps producing the hits as he delivers yet another great soundtrack, managing to make the songs all sound as if they really do all come from the eighties. For the most part they’re well integrated into the film too with appropriate picturisation that suits the ambiance. The only real miss in this film is the end, where the story switches gear and becomes a more typical Tamil herocentric finale with action, drama and a few too many pontificating speeches. It’s a disappointing end to an otherwise engaging film, but thankfully there are some last-minute shenanigans over the end credits to make the audience leave with a smile. Overall this is a fun film and with such a great cast of characters and the always charismatic Suriya, Thaanaa Serndha Koottam turns out to be an enjoyable and overall very funny watch. Worth catching for Suriya, Ramya Krishnan and Anirudh’s soundtrack. For a science fiction film about time travel there is something more than a little magical about 24. Vikram Kumar has come up with a compelling story and made a technically excellent film with a well-chosen cast who all perform beautifully. Suriya is outstanding, favourites Ajay and Saranya Ponvannan are impressive in rather more substantial roles than expected and the whole film is a wonderful masala mix of action, drama, romance, comedy and mystery. Definitely one to catch in the cinema to fully appreciate the VFX but also well worth watching for the expertly crafted story and first-rate cast. 24 combines many of the usual elements of a Tamil film, but although the ingredients may be commonplace the resulting story is refreshingly novel. First there is the rivalry between two brothers; Sethuraman and Athreya (both Suriya), one a brilliant but obsessed and oblivious scientist working on a device that will allow travel through time, and the other his jealous and coldly calculating elder brother who will stop at nothing to steal the device for himself. Moving 26 years into the present day, there is Sethuraman’s son Mani (also Suriya) who knows nothing of his past, his adopted mother Sathyabhama (Saranya Ponvannan) who has sacrificed everything to keep Mani safe and the evil Athreya still trying to track down the device to try to rewrite his own past. These are all familiar plot elements but here cleverly put together to ensure there are plenty of surprises throughout and just when it seems the next step in the journey is inevitable, Vikram Kumar twists the path and the story heads off in an unexpected direction. The opening scenes are amazing and although supposedly set in 1990, the steam train, cars, motorbikes and fairy tale-like mansion give an older-world ambiance. This is helped by the lighting which is golden, warm and suggestive of candle-light especially when compared to scenes set in the present day that are lit more brightly with colder, bluer lighting. Sethuraman has converted his entire house into a gigantic laboratory to work on his invention, and in typical mad-scientist style he has secret rooms, hidden passage-ways and odd devices everywhere. Think Wallace (Wallace and Grommit) with a bigger budget. Thanks to the intervention of a CGI eagle, Sethuraman manages to create a watch that will allow time travel but before he can celebrate his success, his elder brother Athreya shows up to steal the invention. Suriya’s Sethuraman is a classic bespectacled and nerdy inventor, right down to his abstraction when his wife Priya (Nithya Menen) tries to get him to help with their young son Manikanden and various dangerous substances inappropriately placed for safety around the room. This of course allows for maximum damage when Athreya shows up but paint a picture of a ‘typical’ scientist which Vikram Kumar then turns on its head as Sethuraman turns out to be more practical than first impressions suggest. The opening scene sets the precedent for the rest of the film – there is a good amount of humour, plenty of action and drama with Suriya drawing all eyes and commanding centre stage throughout. The film moves 26 years into the future where Mani is grown up and working as a watch mechanic with no knowledge of his past, or just what he has in an unbreakable box that he cannot open. Athreya is still around too, although after the events 26 years ago he is a crippled shadow of his former self getting around in a motorised wheelchair after waking up from a coma. Athreya is as malevolent as ever and with the help of his trusty sidekick Mithran (Ajay) goes about trying to turn back time 26 years to reverse his accident and regain the use of his legs. Again Suriya does a fantastic job with the character of Athreya – he’s confidently wicked in 1990 when he goes after his brother and his family, and wonderfully warped and bitter in 2016 as a twisted figure in a wheel-chair. Suriya brings the character to life and makes him so much more than a stock evil villain. Mani is more the kind of character Suriya has played in recent films, but with a hint of mischievousness that differentiates Mani from the likes of Massu and Raju Bhai. There are some well scripted moments between Mani and his onscreen mother Sathyabhama which give Saranya Ponvannan more than the usual mother/son dialogues to get her teeth into. As always she’s the quintessential filmi ma, but here she gets to have a back story and separate personality aside from being a mother and she rises beautifully to the opportunity. There is also a romance – of course – there has to be a romance! Mani falls for Sathya (Samantha) just as he discovers his father’s watch, and the romance is partly an excuse to showcase all the things the watch can do. The love story is the most conventional part of the film but Suriya and Samantha have good chemistry and Vikram Kumar adds in some light-hearted comedy to ensure the romance doesn’t overcome the action. Girish Karnad, Mohan V. Raman and Sudha as members of Sathya’s family add more background and all are good in their respective roles. A.R. Rahman provides the music, but it’s around an hour in before the first dance number which is the appropriately electronic sounding Kaalam en Kadhali. I loved Suriya’s dancing in this – it was definitely worth the wait! The rest of the songs are more romantic and fit less well into the narrative, although I did appreciate the black and white co-coordinating costumes in Naan Un. The music itself is lovely, but the songs slow down the narrative and really don’t seem particularly necessary to move the story forward. Although there is plenty of good comedy in 24, it’s kept light and even Sathyan, as Mani’s friend Saravanan, is more restrained than usual. It is still laugh-out-loud funny in parts though which provides a good contrast to the few more violent scenes, particularly one just before the interval which is shocking in its sudden brutality. However that is the exception and most of the fight scenes rely on intelligence rather than brute force. 24 has the look and feel of a Hollywood film without losing any of its Southern Indian roots. If this had been a Western film, no doubt 3 different actors would have been cast in the different roles of Mani, Sethuraman and Athreya, but in part the film works so well here because it is the same actor in all three roles. Watching Suriya play three very different characters is mesmerising all by itself while ensuring the familial relationship forms part of the story. Plus more Suriya is generally a good thing! The visual effects are slick, polished and look amazing, while the cinematography from S. Tirru is excellent, adding another layer to the story and ensuring a sophisticated look to the film. Vikram Kumar impressed me in Manam with his ability to make a complex story flow easily and he does it again here. Yes, there are a few too many coincidences and no-one seems to worry about what will happen to the future when the past is altered, but these are small issues that don’t seem to matter when the rest of the film is so well done. 24 is an excellent piece of storytelling and the best big budget film of the year so far. Don’t miss it! I didn’t manage to see this in the cinema in Melbourne, but did manage to get a DVD copy with English subtitles. Rather strangely it was also the only film they had on the bus in Tamil Nadu this year and I ended up watching the opening scenes over 10 times on the way to various villages in TN. 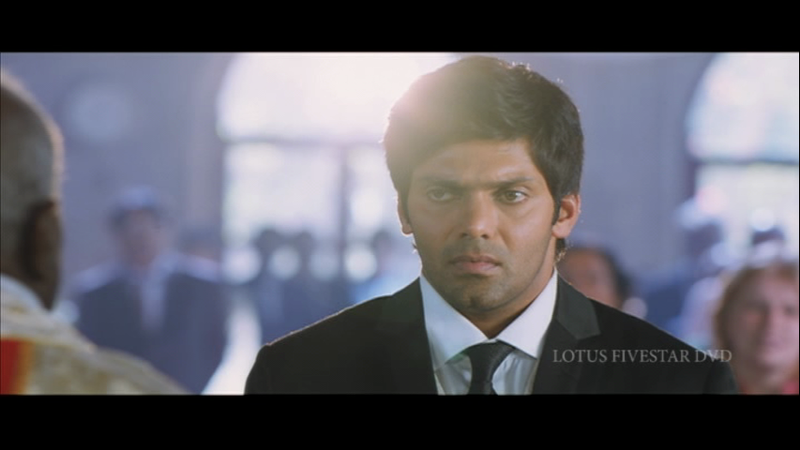 This added exposure gave me enough time to appreciate just how outlandish Nayanthara’s make-up looks, and just how uncomfortable Arya appears in his suit at the opening wedding which is a good precursor to how their relationship develops. In fact, the lead couple are rather uninspiring throughout this film – at least when paired with each other – but thankfully co-stars Jai, Santhanam and Nazriya Nazim are more appealing and their presence does make Raja Rani worth a one-time watch. The story starts with the arranged marriage of Regina (Nayanthara) and John (Arya) who are going through the matrimonial motions for the sake of their respective families. Or so we are told. Except as the film progresses this wedding seems to make less and less sense. The couple obviously dislike each other and I cannot see why Regina’s relatively wealthy and cosmopolitan father would agree to marry her to someone like John. He seems to have neither the requisite high flying job nor appropriate family background for such a match. However, as completely random as it seems, and despite the lack of any reasonable explanation the wedding goes ahead even with the bride forgetting her prospective partner’s name and both parties complete lack of enthusiasm throughout the ceremony. It’s a match that seems doomed to end in divorce. John spends his days at work and his nights drinking with his friends before returning home, usually to a locked door. Regina hogs the bathroom, sobs into her pillow at night and generally ignores her husband as much as she can. It all feels very unrealistic and overly dramatic – after all there is a large couch in the other room where Regina could sleep if she wanted, and surely John could organise a key to their apartment rather than sleep on the doorstep? All the OTT drama makes it difficult to care about either John or Regina since they are equally obnoxious to each other, and I really had little interest in their relationship. 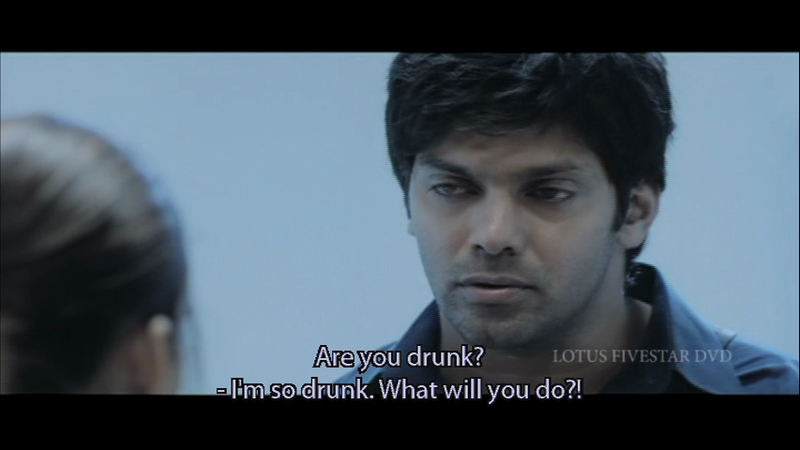 That’s not to say that Arya and Nayanthara are particularly terrible, but all Arya has to do in the first half hour is pretend to be drunk while Nayanthara doesn’t stop crying or complaining long enough to do anything remotely interesting either. Thankfully there is relief in sight, but until we get there Santhanam lightens the atmosphere and is mildly amusing as John’s best friend Sarathy. Finally there is an incident which prompts John to find out a little more about his wife. There is some very dodgy medicine on display as Regina has an epileptic fit while her husband seems totally incapable of any sensible reaction, although he does eventually manage to call an ambulance. Needless to say, despite all the thrashing around and foaming at the mouth (sigh – when will Tamil cinema consult a doctor for some plausible medical problems?) Regina manages to come through the whole episode with her make-up and eyelashes intact. That’s a relief! However, after being berated by her doctor for not knowing anything about his wife’s condition, John does discover the reason behind her ‘illness’. Lost love – of course! The film gets much better when we head to a flash-back to Regina’s first love, although to be fair this doesn’t have the best of beginnings either. Jai is excellent as love interest Surya, an incompetent call centre employee, and finally there are some real emotions and reasons to empathise with one of the characters. Regina is as obnoxious as before, but the role of spoilt rich brat suits her better when she’s a student and she does seem to be more tongue in cheek with her tantrums. Sathyan makes an appearance as Surya’s friend Iyappan and his comedy shtick complements Jai’s weedy persona well enough to make a reasonably funny duo. Although the romance is typically filmy there is some chemistry between the two actors and while we can see the unhappy ending coming, Regina never does and is devastated by losing her first love. It turns out that John has his own sob story, and although it’s another predictable run of the mill tale, again it’s a more believable romance with good chemistry between the actors. 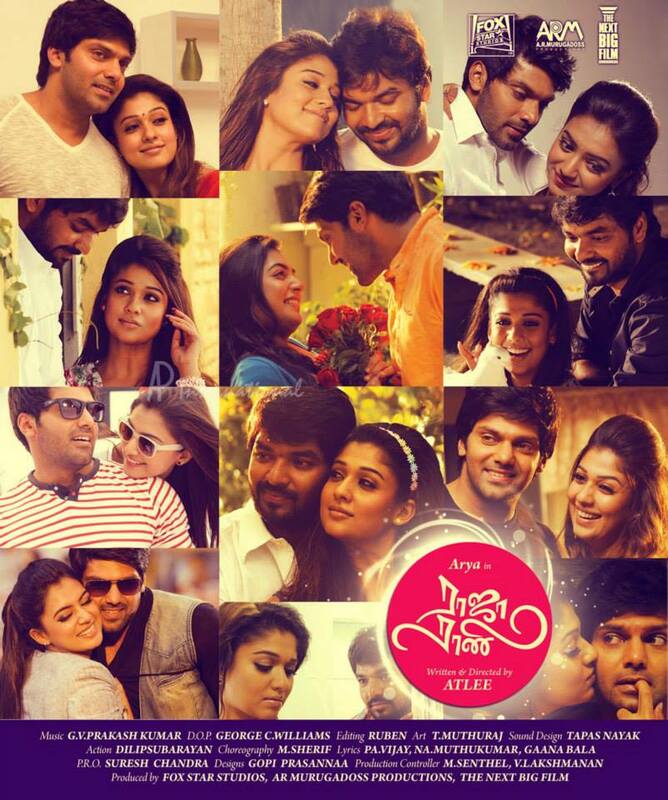 In particular Nazriya Nazim is scintillating as Keerthana and she is the best thing about the whole film. She has an excellent introduction and her cheeky impishness lights up the screen whenever she appears. She has much more personality and is much livelier than in Naiyaandi, which just goes to show the difference between a well written character and one that basically isn’t! Arya is also transformed into a younger, fitter John who is more personable and likeable, and again there is some reasonable chemistry between him and Keerthana. It’s not all good though – Santhanam suffers under the burden of some terribly bad hair which seems to make him more pathetic and less amusing than in the first half, but it works out for the best as Nazriya has the comedy covered too. 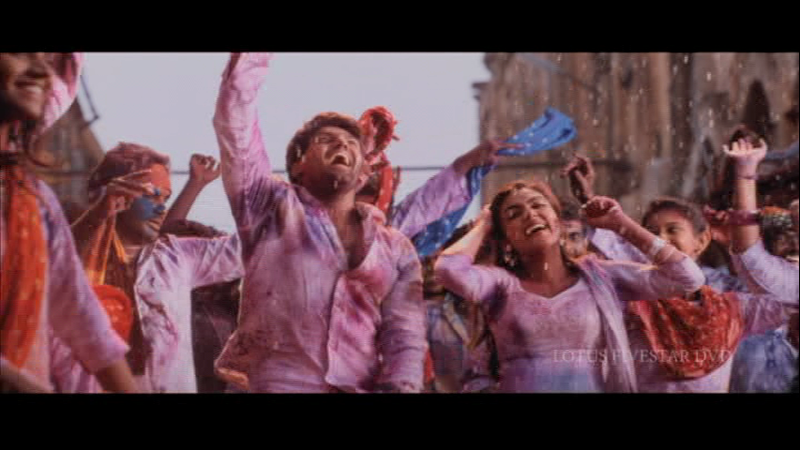 The main problem I have with Raja Rani is that the relationship between John and Regina never generates any appeal or gives an opportunity to feel sympathetic towards the characters. There are some interesting issues brought up here but they are dealt with in a shallow and filmi way which results in a lack of connection between the characters and the audience. There is no apparent reason for the couple’s actions towards each other, considering that they don’t appear to have met before the wedding, and it seems strange that they would behave so badly to each other right from the start. The concept of an arranged marriage between two people who have both lost their first love has potential but Atlee wastes it by playing the relationship for laughs and never giving his characters a chance to behave like rational adults. I found it incredibly frustrating to watch Arya and Nayanthara appear so wooden and lifeless for most of their on-screen time together, when the difference was so obvious when Arya was partnered with Nazriya and Nayanthara with Jai. A little more time spent on developing the relationship between Regina and John at the beginning along with a more adult treatment of their problems would have made this a more entertaining watch. However I did enjoy seeing a better performance from Nazriya and I liked the idea behind the film, even if the execution didn’t quite live up to expectations. 3 ½ stars.